Extraordinary sound out of a small enclosure. 2x 20 Watt, 5 High level inputs, American walnut feet. This amp is able to frighten a lot of top-dog amplifiers because of its sheer intensity and power of expression. 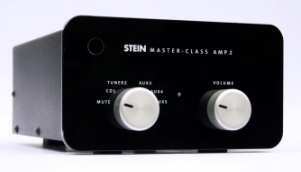 The Masterclass Amp 2 Signature Version comes with extra OsCon caps, Eichmann terminals, better internal wiring and resonance optimized.